The history of Hamilton as a British city started in 1790 when 145 acres of land was set aside by the Bermuda Government for its future seat, which was officially incorporated in 1793 by an Act of Parliament and the Colony’s capital was relocated to Hamilton from St. George in 1815. The city had also been at the political and military heart of Bermuda since then and government buildings included the parliament, Government house to the north, the former Admiralty house of the Royal Navy to the west and the British Army garrison headquarters at Prospect Camp to its east. The town of Hamilton was founded and named after Sir Henry Hamilton who served as a Governor of Bermuda since 1788 to 1794. He was also instrumental in supporting the settlement of a town in the central parishes and though the people of St. George objected strongly to the creation of this new town, Hamilton felt it otherwise which made sense to have a town in the central area which would be close to people from all over the Island. The new town of Hamilton developed quickly and overtook the Town of St. George and became the capital of Bermuda in 1815 during Richard Darrell’s Mayoral term which was considered to be one of Hamilton’s most outstanding Mayors. The City of Hamilton became the hub of international as well as local business on the Island. Hamilton is packed with historic building, shops, museums, churches, galleries, parks and gardens which are all set alongside a beautiful natural harbour giving it a unique character. The city’s layout is great for strolling together with its relaxed elegance, beautiful pink beaches and golf courses. 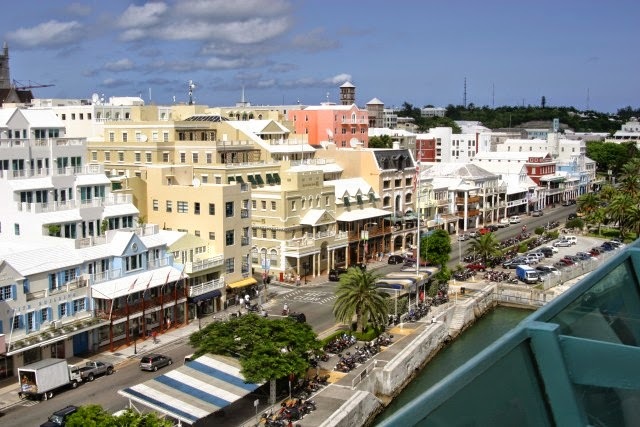 Being the capital of the island since 1815, Hamilton Bermuda is a small, vibrant and a friendly city and is the heart and commercial hub of the island and besides being the main container port in the island it is also the centre of shipping and trade in Bermuda. The town of Hamilton became a city in 1897 before the consecration of the Cathedral of the Most Holy Trinity in 1911, Church of England that was under construction at that point of time. St. Theresa’s, a Catholic cathedral was constructed later on and presently the city overlooking Hamilton Harbour is the main business district with few structures besides office buildings and shops. The city has maintained a building height and view limit stating that no building should obscure the Cathedral. During the 21st century, buildings were planned and some under construction are as high as ten stories in these area. Hamilton is centrally located in Pembroke parish which faces the Hamilton Harbour. Front Street is the main life and soul of Hamilton city as well as the centre of all activities. It is at this location where most of the island’s shops, retail shops, restaurants, and various other commercial establishments like banks and insurance companies are placed. It runs alongside the water edge which is the first sight of the city seen by the cruise ship passengers as they come to shore in Hamilton.